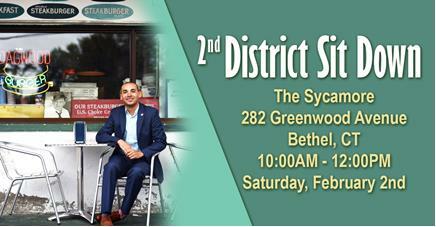 Please join me on Saturday, February 2nd, at the Sycamore, 282 Greenwood Avenue in Bethel at 10:00AM for an opportunity to sit down and talk about issues that are important to the 2nd District and the State of Connecticut. I look forward to meeting with you to discuss issues you want addressed during this legislative session and any questions or concerns you may have. See you there! Town Budget Referendum set for Tuesday, May 7th.